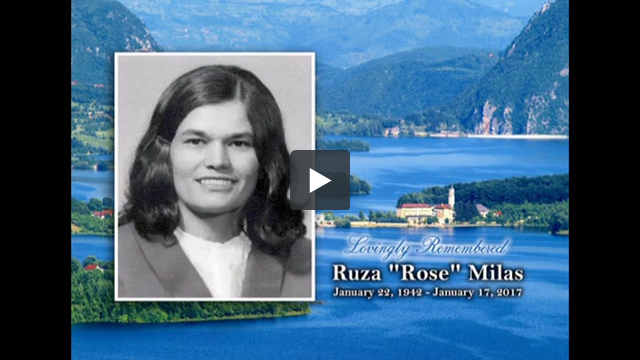 Ruza “Rose” Milas (nee Filipovic) passed away on Tuesday, January 17, 2017 at the age of 74. Ruza was born in Rama, Croatia. She immigrated to Canada in 1966 to marry her childhood love Zvonimir. They were blessed with two daughters and two sons. She was a devoted mother, wife and homemaker while working full time at a Elkford, BC Coal Mine. She loved living in Elkford because the scenic landscape and the serenity resembled her hometown. For over 45 years she was a dedicated parishioner of the Elkford St. Bernard’s Catholic Church, and in her retirement years an active member of the 50+ Club. Crocheting and knitting were her strong passions, making sure everyone had at least one pair of warm and colourful slippers. She will be remembered for her long walks around town, delicious cooking and famous pita. Her kindness, generosity, unconditional love as well as her soothing voice and endearing wave touched many. Ruza is survived by her four children: Magdalina, Ivan, Martin (Irena) and Kata (Larry) and granddaughters Lea and Mia; her brother Ivo Filipovic and his family in Pozega, Croatia. She was predeceased by her husband Zvonimir, her parents Josip and Kata, and her brothers Ante and Mile. Funeral Mass will be celebrated at St. Bernard’s Catholic Church (800 NATAL, Elkford, British Columbia on Saturday, January 21, 2017 at 11:00 a.m. Relatives and friends are invited to Prayers at Our Lady of Marija Bistrica Croatian Catholic Church (14680 Deer Ridge Drive S.E.) on Monday, January 23, 2017 at 7:00 p.m.
Funeral Mass will be celebrated at Our Lady of Marija Bistrica Croatian Catholic Church (14680 Deer Ridge Drive S.E.) on Tuesday, January 24, 2017 at 11:00 a.m. Graveside Service to follow at Queen’s Park Cemetery. Following the Graveside Service, relatives and friends are invited to meet with the family in the “Reception Centre” at McInnis & Holloway “Deerfoot South” 12281 – 40th Street South East. Condolences may be forwarded through www.mcinnisandholloway.com. In living memory of Ruza Milas, a tree will be planted at Fish Creek Provincial Park by McINNIS & HOLLOWAY FUNERAL HOMES, Deerfoot South, 12281 – 40th STREET S.E.. Telephone: 403-203-0525. The universe has lost a gentle soul. May God’s peace be with you all in your time of sorrow. Rest in peace, Rose. Rest in pease Rose. Your gentle spirit will be forever remembered. Rose was my friend for many years. She always had a smile for me, and many times I would be treated to some of her baking as we enjoyed a cup of tea. She made sure my children had slippers and later shared some for my granddaughter. Our thoughts and prayers are with the Milas family as they grieve the loss of their beautiful mother. Once again the Milas family suffers another loss. Our heart felt condolences to the family. So sorry for your loss. Your Mom was such a sweet soul, may she rest in peace. Maggie, I’m thinking of you and your family at this difficult time. I will always remember the lovely slippers that your mom knit for my girls and her kind heart. You are in my thoughts. Deepest sympathy. Maggie………. So sorry to hear of your Mom’s passing our prayers are with you. Please except our Deepest Sympathy. So very sorry to hear about your mom. Whenever I would see her she always had a smile for me and we would chat for a bit. She was such a soft spoken beautiful woman and will be missed by many. I am sad to hear of Mrs.Milas passing on. I have known her since childhood and she was always very kind to me. Our condolences to the family and friends of Rose, a truly wonderful woman, who will be missed by many and always remembered. To the Milo family . my condolences go out to you all . Your mom was a wonderful lady in many ways . we used to have a wonderful time . we all miss her . R.I.P our friend Rosa . I’m very sorry for your loss. Rose was a wonderful person and she will be missed. The service was a touching tribute to her. We are saddened to hear of Roses passing.Our heartfelt sympathy goes out to the family.She was a kind and good woman.